The posture of President Trump on Crimea is well known and he stands firmly by it, he continues to maintain that it was illegal to annex it. We – our viewpoint is different. Through the first part of the press conference, when President Putin and President Trump gave their opening remarks, it was pretty much like all such press conferences following meetings between heads of rival states. We had a productive conversation; there are many areas where we disagree; we need to cooperate on certain issues like Islamic terrorism; we are looking for ways to have a more constructive relationship. Such statements border on the ritualistic. It was when the two presidents took questions from reporters that things went South. As Paul says, criticism has justifiably focused on two points. First, Trump assigned blame for bad relations between the U.S. and Russia equally to both countries, while seeming to imply that if anything, his predecessors in the White House might merit particular condemnation. Trump was wrong, but it is ironic that Democrats take offense at this–Trump isn’t sufficiently patriotic!–when for decades, the Democrats’ position, first held by the left wing of the party and finally by the party as a whole, was that the U.S. was primarily to blame for the Cold War. The Russians were merely acting reasonably in response to aggressive threats from America! Where is Noam Chomsky when we need him? Moreover, Trump’s suggestion of moral equivalence, while clearly wrong, was not as offensive as President Obama’s apology tour, when he blamed strained relations between the U.S. and Islamic countries on American “arrogance.” Democrats universally defended Obama at the time. During today’s meeting, I addressed directly with President Putin the issue of Russian interference in our elections. I felt this was a message best delivered in person. I spent a great deal of time talking about it and President Putin may very well want to address it and very strongly, because he feels very strongly about it and he has an interesting idea. The interesting idea being, apparently, that someone else did it. However, when questioned by reporters, Trump, instead of responding as a head of state, took the role of an aggrieved party in a political conspiracy. He expressed agnosticism as to whether it really was the Russians who obtained and disseminated the DNC emails that showed the primary process was rigged in Hillary Clinton’s favor. He went off on a riff about about non-existent collusion, the electoral college margin, the DNC’s refusal to turn its email server over to the FBI–he is right about this, of course–and Hillary Clinton’s 33,000 emails. In pursuing these themes, Trump was venting his own personal rage–entirely appropriate rage, in my view–against the Democrats who are trying to destroy his administration and are happy to sacrifice American interests in the process. But the role of a head of state is not to vent personal grievances, but to advance the interests of his country. I don’t think Trump did anything wrong in meeting with Putin, nor do I think he negotiated in an inappropriate way or gave anything away. I think his desire to meet with Putin one on one and try to develop a constructive relationship was entirely reasonable; in fact, George W. Bush and Hillary Clinton did exactly the same thing. If Putin and Trump had waved goodbye to the assembled reporters after delivering their assessments of the day’s meetings, there would have been no news stories. Instead, President Trump couldn’t resist going off-script and airing his personal grievances in answering reporters’ questions. It was a failure of judgment and discipline. I am not certain that the Russians were behind the DNC phishing, either. But this was not the time or place for the president to express lack of confidence in the CIA, notwithstanding the fact that that agency was corrupted, politicized and weaponized by Barack Obama. Most often, Trump goads his enemies into saying and doing stupid things. 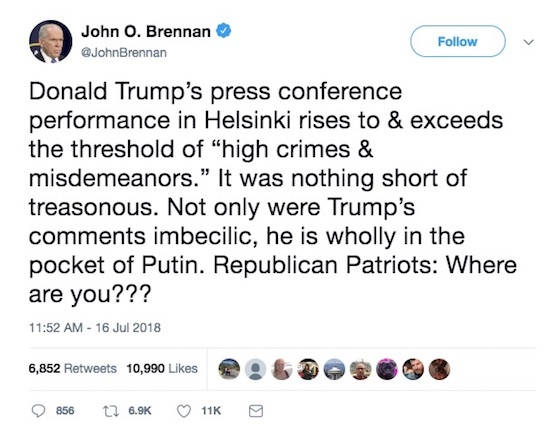 Here, unfortunately, it was the Democrats who got under Trump’s skin and caused him to turn a diplomatic event, which by its nature should be boring, into a personal vendetta. The fact that the Democrats then responded far more crazily won’t change the reality that this was, as far as I can recall, the president’s first diplomatic failure.